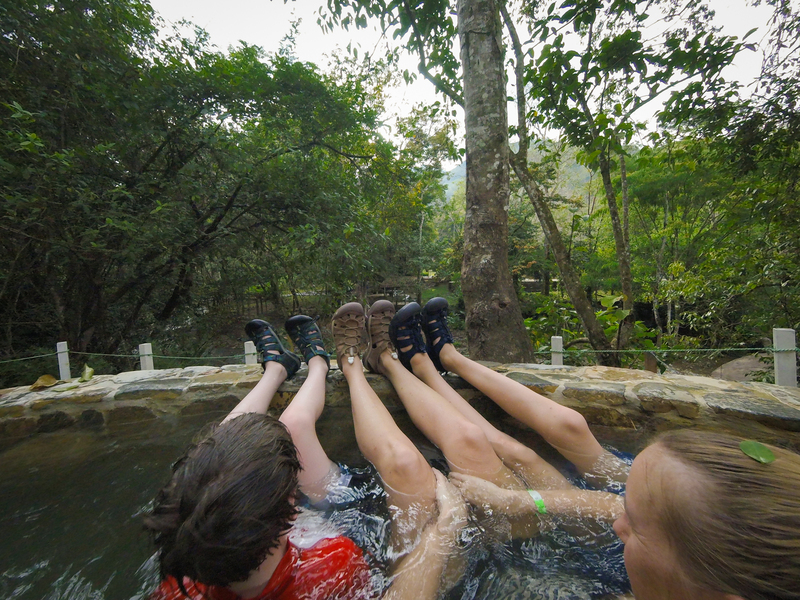 Soaking in the Luna Jaguar Hot Springs in Honduras. When we travel, we try to travel light. Since we each need to carry everything we need/want for our lengthy trips, we only bring what we are going to be using regularly. Among other things, that means we aren’t carrying a bunch of shoes. It also means that the shoes we bring need to work in multiple situations. They need to go from “hiking” in a river to strolling through a Spanish colonial city. 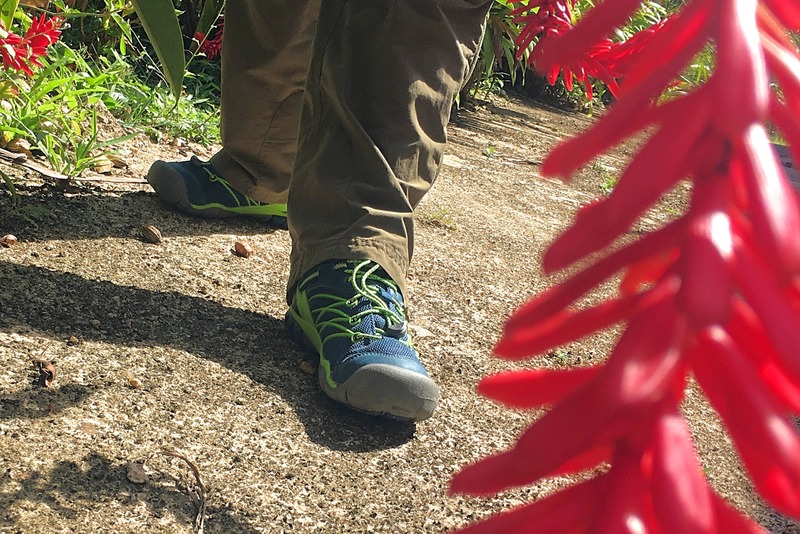 On our current trip through Guatemala, Honduras, Belize, and Mexico, we each brought a pair of sandals and hiking shoes or trail runners. Keen set our family up for all the activities we had planned and some spontaneous fun as well. One of the things I like about Keen as a company is that they are socially and environmentally conscious. When I think about how many shoes we go through in our lives – especially our constantly growing kids!—I want to make sure I am minimizing my environmental impact where I can. Since 2003, Keen has donated $15 million to nonprofit causes around the world. They aim to be a change for good by 1) giving back, 2) taking action, and 3) reducing their impact. Read more about Keen’s do-good policies on their website. The kids have worn Keen sandals every summer since they were itty-bitty. Those first pairs were absolutely adorable. Now Anders and I wear the same size (!). It’s less adorable, but more convenient for shoe sharing. See my Keen kids’ snow boot review here. Watching the kids swim in a hot spring near Rio Dulce, Guatemala. This is the first pair of Keens I’ve owned and they are perfect for an active trip like the one we are on now. They are comfortable to wear hiking 45 minutes to a river and great for jumping into an inner tube and floating down that river. When we got out of the tubes mid-float to explore a cave, I was ready to go. 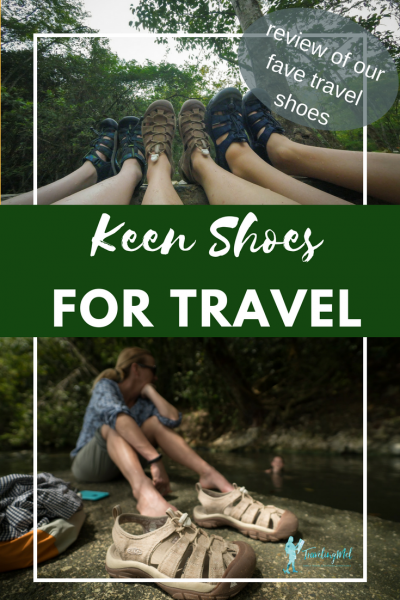 I’ve been wearing my keen sandals on travel days and wandering around towns, too. I love that the toes are covered both in the street and in the river. They are supposed to be quick drying, but mine often take 24 hours to totally dry out. It might be due to the humidity. I love that they are machine washable, because after two months in the jungle and at the beach, I think they are going to need washing. Anders has been testing out these shoes. They protected his toes from a toucan and worked well on our swim/wade/thrash up a gorgeous Guatemalan canyon. I think he’s worn these almost every day except when we hiked the volcano. What I really love about the Newport Eco sandals is that the webbing is made from recycled plastic bottles and the outsoles are made with upcycled rice husks. You know I like the eco-groovy stuff. We haven’t tested it yet, but I am sure the salt-resistant leather panels will come in handy when we get to the Caribbean Sea in a few days. Finn has some Keen sandals (I think the Newport H2) he’s been wearing a lot, but he’s also testing out a lightweight, colorful pair of sneakers. He likes that they are light, but provide protection. They worked great on our volcano hike when we really wanted to keep all the gravel out of our shoes. He’s also had fun testing whether the soles are really non-marking. So far they are. I think Keens will remain on our packing list for a long time. Thanks to Keen for sending us the shoes! The opinions are my own, of course. Nice feet~ I want some of those shoes!!! You should get some! They would be perfect for some of the stuff you do.